Financial expert and investment advisor always preach that holding stock for long term can make you rich. But this may not be true in most of the cases. Many more such investment myths have been spread by investment professionals. 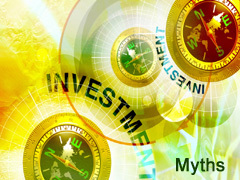 We are here with top 5 investment myths which can work against you in certain situations. Indian markets have generated very less returns in the past five years. Most of financial planner says that stock market gives better returns in long term but what is long term that is not clearly defined. If we actually analyze data Indian stock market have generated very less return in past five years. Some expert may say that 5 year is not long term. Does this mean investors should quit stock market and concentrate on other asset class such as debt, gold or real estate? Certainly not. Market may give less return for certain period but remember there have been bullish phases and bearish periods too. So if stock market does not gives return for long term what is to be done? Thing which you can do is if your stock is earning some profit than book profit periodically. This is the only way to make serious money from a volatile stock market. SIPs are not a guarantee against loss and don’t always give higher returns. Make investment through SIP. Mutual fund managers have sold this story for years. Please understand that SIP is mode of investing only this helps you in averaging cost over a period of time it does not mean it ensures better returns. When the markets are in a downtrend a lump-sum investment will always helps as during really as you will earn better returns for this lump sum investments. While if you have opt for SIP investment your return will be less under this case due to averaging effect. The real benefit of the SIP investment clicks in when it is continued over a long period of time and across market cycles. Another catch is SIP investment in most of the cases will be fixed and done at predetermined day. Investor will not be aware about market trend on that day which makes SIP investment risky. But if you do SIP investment based on market trend you are aware about market behavior hence you can earn better returns. A tax-efficient option will gives good returns than a tax-free one. Bank deposits and insurance policies are the two most popular investments in India. Almost 45% of the total financial savings of households go into bank deposits, while life insurance accounts for nearly 22%. The concern for most investors is the safety of capital offered by bank deposits and tax-free income offered by insurance policies. They don’t realize that bank deposits are not very tax-efficient because interest is fully taxable. In the 30% tax bracket, the post-tax return of a 9% fixed deposit is pared down to 6.3%. Insurance policies are no better. They offer tax-free income, but the buyer ends up sacrificing too much. The returns from a traditional endowment or moneyback plans are only 6%. Instead, it’s better to invest in the PPF, which also offers tax-free income. The current interest rate is 8.8%. Debt funds offer investor tax efficiency as well as higher returns. After one year, the income is treated as long-term capital gain and taxed at 10%. Yet, small investors account for barely 1-2% of the total investment in debt funds. Buying too many stocks does not really diversify your investments and give better result. We have seen many investors who purchase number of stocks. Their portfolio includes more than 50 stocks. While asking them they said that they have done diversification & this diversification helps them to reduce risk and give better result. According to us diversification of portfolio is protection against ignorance. As you have number of stocks in your portfolio you cannot keep track of all stocks at a time. As you cannot track stocks owned by you it may lead to loss. Diversification can be done by buying only few stocks of different sectors, so one can take advantage of balancing risk. If you are average/ new investor don’t invest in more than 6-8 stocks, because monitoring them will be a challenge. Ratings are based on past performance and don’t guarantee future returns as well. Investors in mutual funds often use the fund ratings to decide which schemes to choose from among the hundreds available. Though the rankings are based on robust statistical analyses and widely used methods of assessment, many investors read too much into these. This can lead to suboptimal investment decisions. It’s important to note that ratings are based on the past performance of schemes. They do not serve to make a judgment about their future performance. A scheme’s performance is not seen in isolation but is rated on the basis of how it performed relative to the other funds in the category. Secondly, ratings can change over time. A five-star fund’s performance may decline, turning it into a four-star or even a two-star fund. An investor who goes strictly by the rating may then have to reshuffle his portfolio and shift to a five-star fund. Nice Points. What the investor should keep in mind ultimately is his investment goal. Then he has to give real thought to the right mix of various investment instruments so that his goals are achieved. No one financial instrument by itself is 100% foolproof and only by a combination of various instruments can we achieve good returns and stay away from losses.